While I've decorated and redecorated my living room a couple of times ever since I've moved in, my bedroom has remained somewhat plain so far. I just haven't quite figured out what I wanna do with the room yet. Still, I felt like a DIY was in order. I had this idea of a picture that was based on the contrasting appearances of the sky: day versus night. A meaningful quote by day and a starlit sky by night. (I'm a bit addicted to stargazing if you haven't picked up on that yet.) That sounded like a plan! 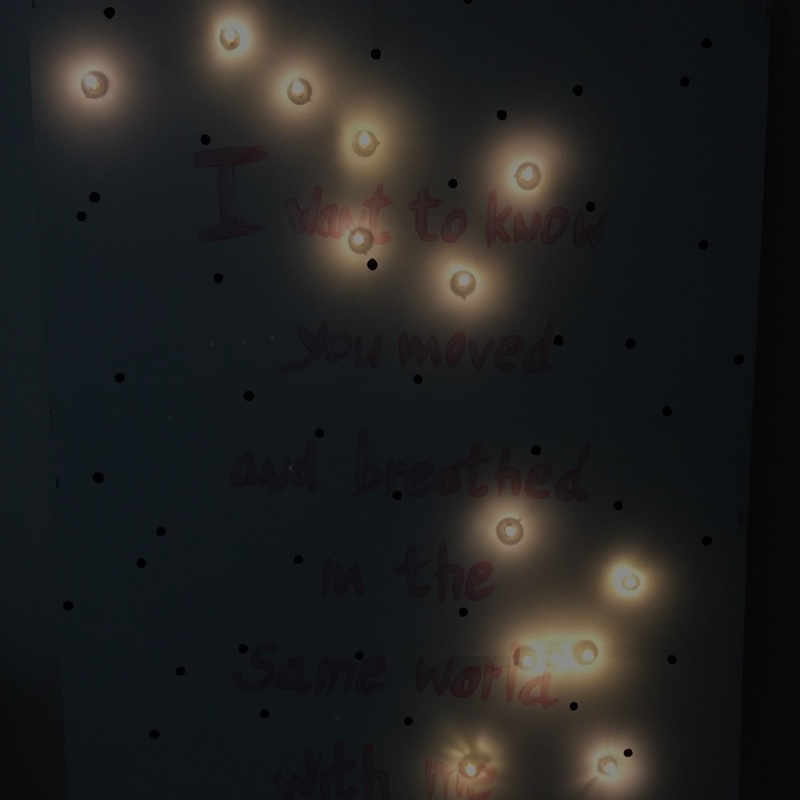 Anne just recently read a book by F. Scott Fitzgerald and I have been stumbling over many of his quotes lately, so we picked a beautiful quote of his to write on the cardboard. We decided on a light pink color, and since Anne is the one with the talent for paint and brushes she wrote both the quote and drew some accents in white. She also encircled the words with pencil to give them more depth. We picked two star constellations and drew them right onto the cardboard, the big dipper and orion. The next step was to drill the holes. 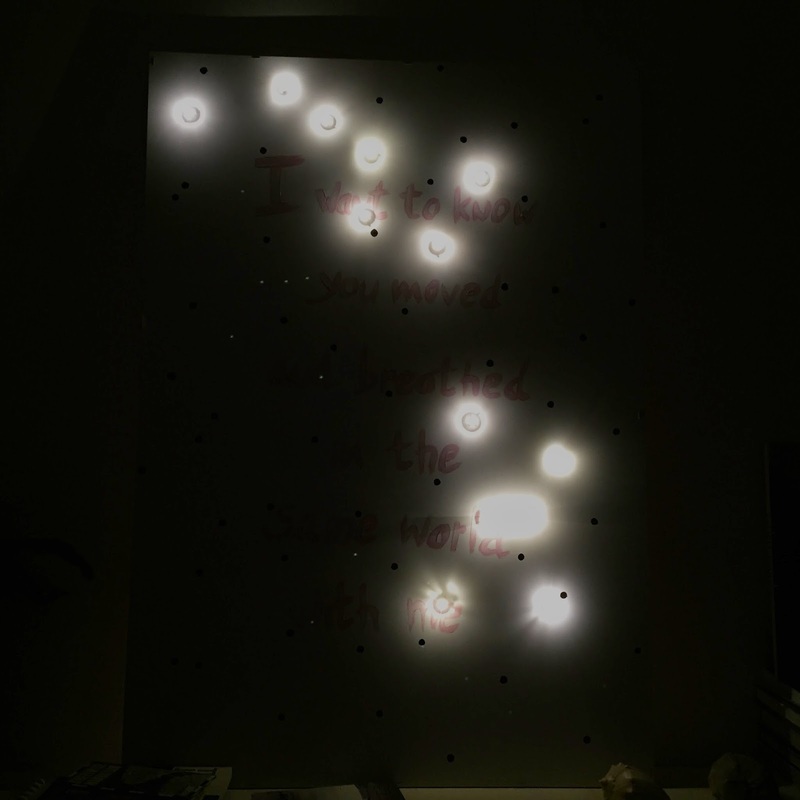 The string lights were a little bit larger than the largest drill bit, so I carefully enlarged the holes by drilling in a circle motion. Since the drill holes were obviously super visible we decided to add random black dots of the same size. Then we build the frame and stapled the cardboard onto it. Last but not least I plugged in the string lights. I always have a couple of them at home and I like to use them year round, not just for Christmas. In the summertime they looked nice on the balcony at night and when it was time to move them inside in late fall I just had them stretched out on my living room floor and would plug them in when I got home from work at night. We love it!! 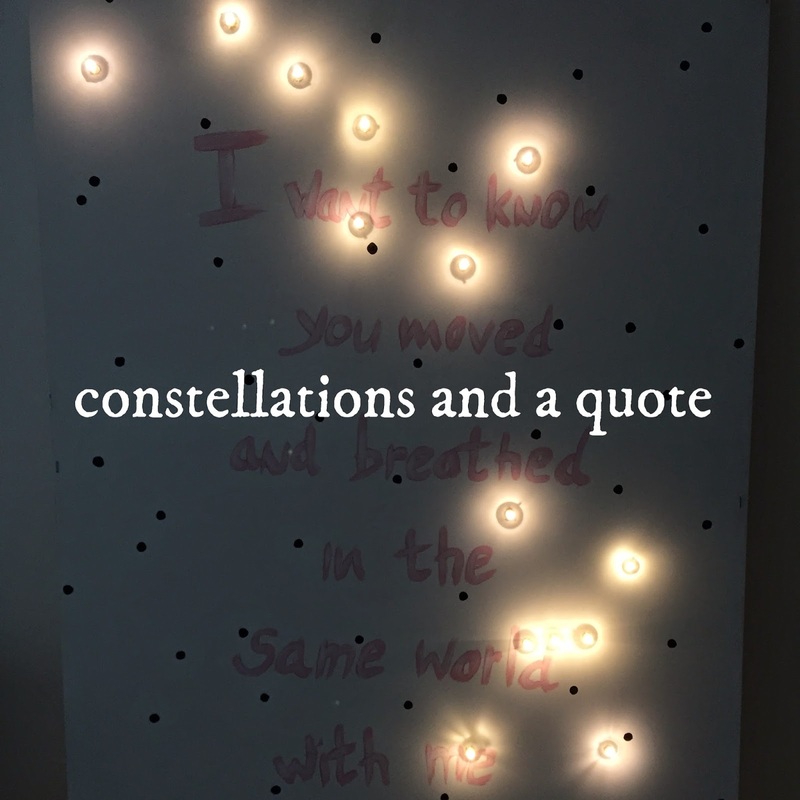 Which quote and which constellation(s) would you pick?